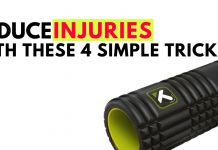 Home Fitness The UGLY Truth About Waist Trainers! 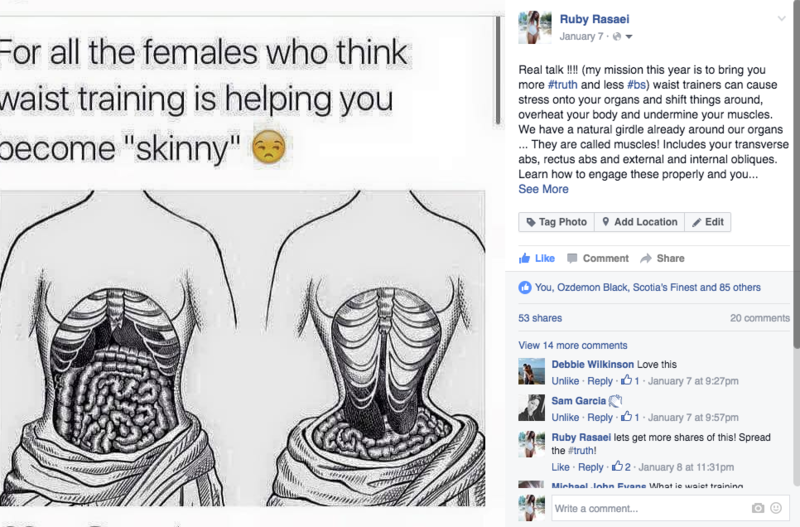 A couple of months back we came across the picture below on social media in regards to waist trainers. After many, many of month of hearing about waist trainers, we’ve decided its time to take a stance once and for all and demystify the hype around these things! 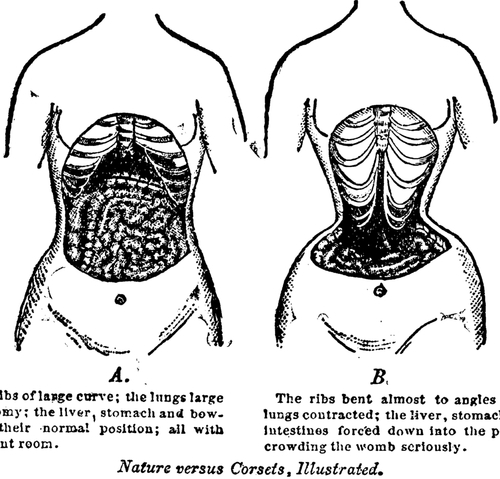 Here is the UGLY truth about waist trainers! Truth About Waist Trainers: What are they? Waist trainers are essentially girdles made of fabric worn around the torso for long period of time (up to 24 hours of each day). Exactly as their name implies they are meant to “train” your waist so it shrinks and reshapes. The idea is to pull the waist trainer in every few days in hopes of reshaping your waist into a smaller version of it. Waist trainers are typically made of heavy fabric or leather… some come with laces that are pulled in tighter every few days. These days, you cannot scroll through your social media without seeing at least one post about “waist trainers”. For us, the waist trainers came to the forefront when our clients (all of which are women) started wearing them to our fitness classes. In fact, there is at least one girl wearing a waist trainer of some sort in every class that we teach! Thanks to celebrity endorsements, waist trainers have become increasingly popular and trendy! What’s the hype and is it too good to be true? Waist trainers promise to “cinch the waist”, give you an “hourglass figure”, “shrink your waistline” and get rid of belly fat… all without the hard work of exercising or dieting! WOA, sounds AWESOME right? Wear a fabric thing around your waist real tight and get a flat stomach? Sign us up! We are SOLD! 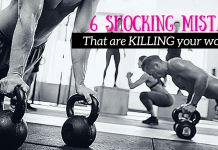 Unfortunately, the hype around these products are very much, well, hyped up and too good to be true! Let us tell you, it’s next to IMPOSSIBLE to shrink or reshape your waist WITHOUT a proper nutrition and exercise program… or without some sort of surgical intervention! Why? Because the science simply does not add up! The human body has its own natural girdle… and you guessed it, it’s called MUSCLE! Our organs are surrounded by tissue, including the transverse abdominus, the rectus abdominis, the internal and external obliques, erector spinae and lumbar muscles in the lower back. There are lots of hard muscles at work keeping us upright and everything together! It just so happens that we also have another type of tissue called fat covering the muscles. You cannot change the shape of your torso or waist simply by wearing a piece of fabric around it. Nor can you reduce the amount of fat cells or fat tissue in your body by wearing a piece of very tight fabric. Science just doesn’t work that way! In fact wearing such things can be dangerous as it suffocates your organs and can cause heat stroke, and a permanent unhealthy shift in your organs. In order to shrink your fat cells, you need to build lean tissue to stimulate your metabolism and adapt a healthy eating regimen (like the one here) that reduces fat tissue! Wearing waist trainers also undermines your muscles as you inherently start relying on it to keep your core engaged as opposed to properly engaging your abdominal muscles when working. Our best advice for those of you looking to cinch in your waist is to start exercising using a solid plan like the one here, learn how to engage your core muscles, adapt a healthy nutrition plan and last but not least be CONSISTENT! It’s that or permanent surgical intervention like removing two ribs from torso! Forget the hype around waist trainers and focus on getting lean and healthy using methods that work!